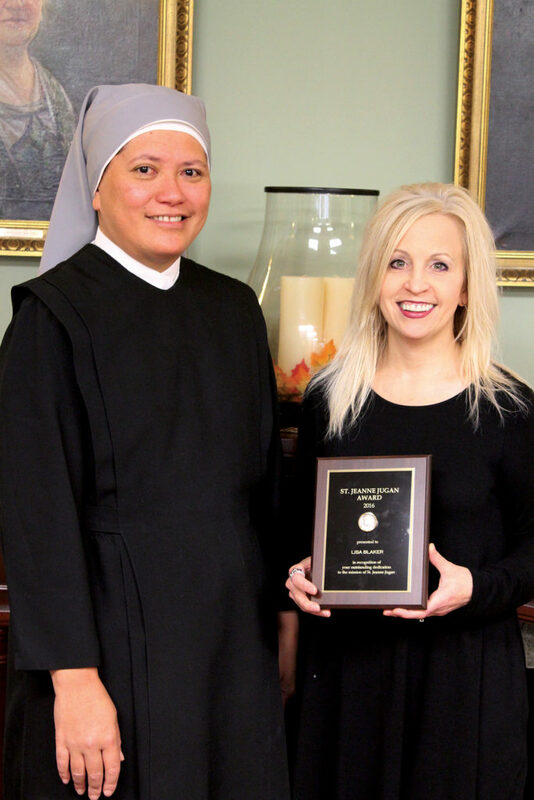 On Tuesday, Oct. 25, Taylor native and Scranton resident Lisa Blaker received the St. Jeanne Jugan Award from the Little Sisters of the Poor at Holy Family Residence, Scranton. Blaker, a 30-year employee who serves as the activities director and volunteer coordinator for Holy Family Residence, received the award for exemplifying the spirit of St. Jeanne Jugan and embodying a work ethic of humble service to the elderly poor. The award, named in honor of the Mother Foundress of the Little Sisters of the Poor, is given annually to an employee who is nominated by his or her peers. Photo Caption: Holy Family Residence employee of the year, Lisa Blaker, receives the St. Jeanne Jugan Award from Mother Theresa Louisa Woo Ching, l.s.p., Mother Superior of Holy Family Residence.